"It's not who's the fastest, it's who reaches the finish line." Profile: As a result of his very disciplined training in the dangerous but vital job on thermal-energy magma-miner back on Cybertron, Nosecone has developed into a very careful warrior. 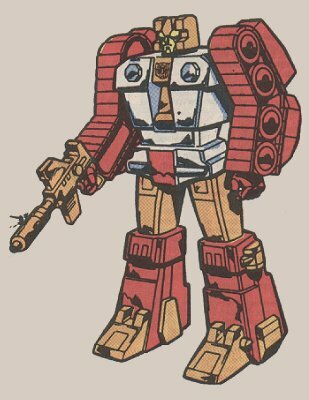 He's slow and methodical in everything he does, weathering enemy artillery fire with the same calm that he exhibits when his fellow Autobots criticize him for his apparent laziness. His attempts to explain his cautious tactics to them usually fall on deaf audio modules and elicit good-natured laughter. But then, Nosecone doesn't realize that his friends are just having a little fun at his expense: Autobots appreciate results, and when Nosecone finishes turning an enemy fortification into steel Swiss cheese, the results of his efforts are unmistakable... and the respect granted to him by his fellow Autobots is obvious. Abilities: In vehicle mode, Nosecone's most distinctive feature is also his most formidable asset: his durabyllium-steel alloy drill can pierce almost any material, and it is virtually indestructible. He also packs two rocket-propelled missiles that use a videocom tracking system to lock on to targets. He's slow of speed, but his treads can carry him across any terrain and up the steepest slopes. In robot mode, he is armed with a high-powered X-ray laser pistol. He combines with his fellow Technobots to form the super-robot Computron. Weaknesses: Nosecone's slowness often lands him in the middle of trouble - namely, a Decepticon artillery barrage. And although his drill is impervious to most weapons fire, his treads aren't, so he often is left immobilized. He also has a tendency to overheat while drilling through very dense substances.